The Folger is building Miranda, a new digital home for its collections. 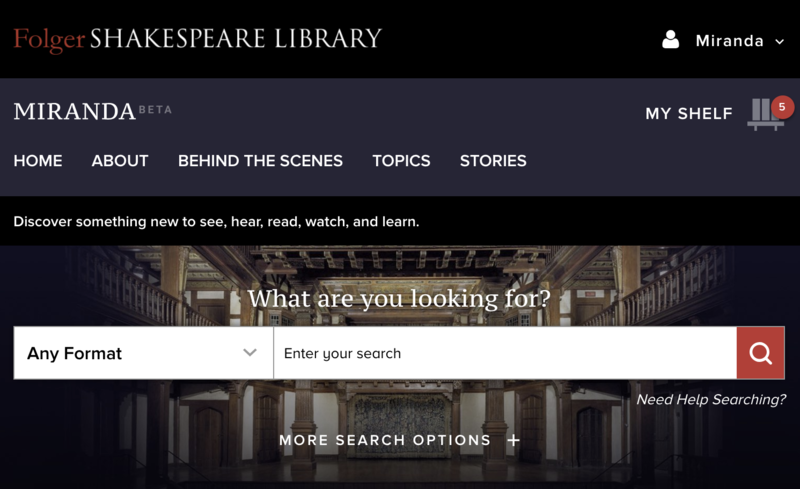 In September 2017, the Andrew W. Mellon Foundation awarded a grant to Amherst College, for the benefit of the Folger Shakespeare Library, to build a full digital asset platform. This platform, called Miranda, will be the primary foundation for the Folger's future digital projects. Miranda is currently in beta at collections.folger.edu. At the project's conclusion by the end of 2019, Miranda will contain virtually all of the Folger’s publicly available digital assets, which range from various kinds of texts to images, videos, audio recordings, and databases. Going far beyond a simple repository for digital materials, the platform will also host digital exhibitions, publications, and software applications. Miranda will foster new collaborative possiblities with cultural institutions around the world that have complementary collections. This will enable the Folger to acquire, catalog, and share digital resources — born within the Folger, or elsewhere — which might otherwise be lost or unavailable to the public. This generous grant follows on an earlier award from the Mellon Foundation in September 2016, which provided funding for the platform prototype. How is the platform built? A web interface that allows users to explore, discover, and view content. A set of API services that allow developers to search and interact with our data. There is an Elasticsearch API that allows for complex searching and filtering of platform data, a GraphQL API for utilizing and consuming DAP content, and a content-type validation microservice that lets developers know the type and structure of different kinds of content stored in the DAP. A centralized repository for all of the Folger's assets. This repository is designed to handle all sorts of assets, and allow for the use of different kinds of storage options. When will Miranda be available? Right now! Miranda is currently available in beta at collections.folger.edu. There's a lot to see, read, hear, watch, and explore, and there is more on the way. We will continue to improve the platform and add to its contents through the next and final phase of the Mellon-funded project. Miranda will be free and publicly available for anyone to use. Where can I find the technical documentation for the prototype? Visit our developer portal for the platform's technical documentation, which will be expanded and updated as Miranda grows. We welcome your feedback about any aspect of Miranda. Please send us an email at miranda@folger.edu or dap@folger.edu.